AOC stands for Appellation d'Origine Contrôlée ( that translates to "Controlled Name of Origin") and is a description of processes and provenance used in France. This label is awarded only after a product (wine/ cheese) has passed a rigorous testing process and meets the strict criteria set out by the French authorities. Fewer than ten village dairies in the region of origin make the cheese according to the strict AOC (protected designation of origin) specifications. 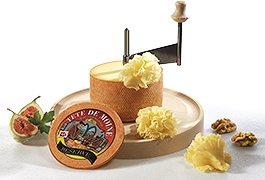 The Tete de Moine AOC is a semi-hard cheese with a silky body that melts easily in your mouth. It is not usually cut but is shaved resulting in cheese resembling delicate rosettes. This increases the amount of air coming into contact the cheese thereby changing the structure of its body and letting its flavour bloom further. How then do we shave it, you may ask. Is there some kind of skill or technique to it? No particular skill - but a special cheese knife called the Girolle. With the Girolle, shaving the cheese into lovely rosettes is a walk in the park. See how the Girolle works here. The Girolle makes shaving the cheese into lovely rosettes a walk in the park! The delicate Tête de Moine rosettes adds an elegant touch to every cheese platter or board you put together. They are, above all, suitable as appetizers with an aperitif or an addition to any buffet. Fresh fruits like grapes, figs or nuts make ideal decorations for the cheese. You might also want to try garnishing your salad with Tête de Moine AOC rosettes. Both the Tête de Moine AOC and the Girolle would make a much desired Christmas present set. This speciality from the Swiss Jura is also an exquisite dessert cheese. Owing to its well-balanced taste Tête de Moine AOC goes with almost any drink. Now available at Huber's Butchery and at www.hubers.com.sg!